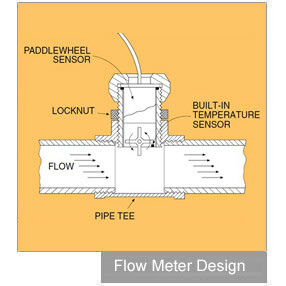 A variable area flowmeter consists of a tapered tube and a float. It is most widely used for gas and liquid flow measurement because of its low cost, simplicity, low pressure drop, relatively wide rangeability, and linear output. Also used in gas and liquid flow measurement, these flowmeters can be mounted in any orientation. Scales are based on specific gravities of 0.84 for oil meters, and 1.0 for water meters. Their simplicity of design and the ease with which they can be equipped to transmit electrical signals has made them an economical alternative to variable area flowmeters for flowrate indication and control. Thermal-type mass flow meters are used for the measurement of mass flow rate of a fluid, primarily gases. Popular applications include leak testing and low flow measurements in the milliliters per minute range. They operate with minor dependence on density, pressure, and fluid viscosity. This style of flowmeter utilises either a differential pressure transducer and temperature sensor, or heated sensing elements and thermodynamic heat conduction to determine the true mass flow rate. Ultrasonic flowmeters are noninvasive and commonly used in clean or dirty applications that ordinarily cause damage to conventional sensors. The basic principle of operation employs the frequency shift (doppler effect) of an ultrasonic signal when it is reflected by suspended particles or gas bubbles in motion. The transit time method depends on the slight difference in time taken for an ultrasonic wave to travel. Turbine meters give very accurate readings and can be used for the measurement of clean liquids. They require a minimum of 10 inch pipe diameters of straight pipe on the inlet and 5 inch on the outlet. The unit consists of a multi-bladed rotor mounted within a pipe, perpendicular to the liquid flow. The rotor spins as the liquid passes through the blades. The rotational speed is a direct function of flow rate and can be sensed by a magnetic pick-up, photoelectric cell, or gears. Turbine meters are particularly good with low-viscosity liquids. One of the most popular cost-effective fluid and water flowmeters. Many are offered with flow fittings or insertion styles. These meters require a minimum of 10 inch pipe diameters of straight pipe on the inlet and 5 inch on the outlet. Chemical compatibility should be verified when not using water. Outputs come in Sine wave, Square wave, and also transmitters for panel mounting and built-in systems. These meters are used for low to high viscous applications when no straight pipe is available. Operation of these units consists of separating liquids into accurately measured increments and moving them on. These meters are good for liquids where a simple mechanical meter system is needed. The positive displacement are also used for viscous liquids. Electromagnetic meters can handle most liquids and slurries that are electrically conductive. Pressure drop across the meter is the same as it is through an equivalent length of pipe because there are no moving parts or obstructions to the flow. Electromagnetic flowmeters operate in accordance to Faraday’s law of electromagnetic induction, which states that a voltage will be induced when a conductor moves through a magnetic field. The liquid serves as the conductor; the magnetic field is created by energised coils outside the flow tube. Renowned for their outstanding accuracy and versatility in measuring challenging flow applications, Coriolis meters can detect the flow of all liquids, as well as that of moderately dense gases. These meters are excellent on applications where multiple measurements such as mass flow, volume flow, temperature, and density are needed. 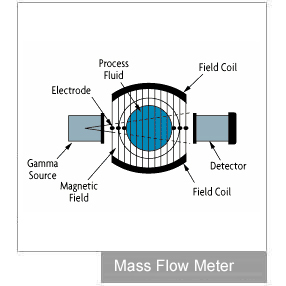 A Coriolis flow meter works on the principle that the inertia created by fluid flowing through an oscillating tube causes the tube to twist in proportion to mass flowrate.